First and Second graders are so excited about their new graphing project for their Data Wall. We will be creating a picture graph on the hall bulletin board each month that shows how many students are actively reading at home and participating in the Book-It program. This program encourages children to read at home, recall the story, and draw and color a picture for 4 different books throughout each month. When your child achieves their monthly goal, they will receive a free Personal Pan pizza certificate from Pizza Hut to help them celebrate each month. Your child will be bringing home goal sheets for them to draw and record information about the stories read. Please share this special reading experience with your child. And also, if you are ever in the building, please check out the fun and interactive data wall that they will be creating and updating. Thank you. 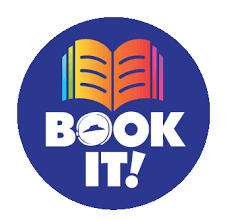 If you need additional "Book-It" forms please feel free to download and print them off from our documents section of the website or ask your teacher for more forms.